I never thought I'd see the day when I would be more excited to see the UPS man deliver a package for Truffles than for me, but that's exactly what happened when she was offered the opportunity to try out a SkratchKabin. 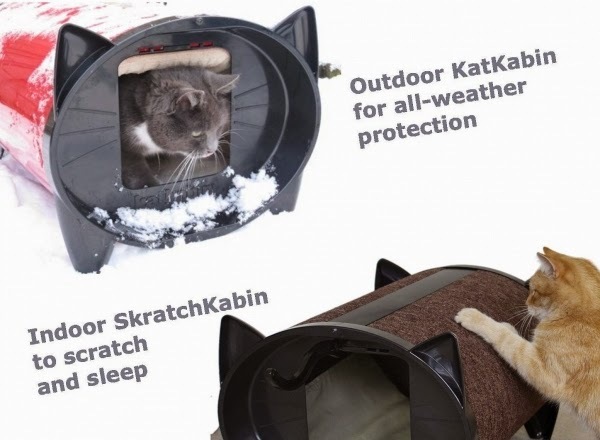 You may be familiar with the original KatKabin outdoor cat house, designed to give cats all the comfort and safety they are used to indoors. Standing above the ground, it provides a warm, cozy outdoor shelter for napping, stretching and relaxing in all weather conditions. The standard version comes with a removable KatFlap and a washable KatKushion. It is also available in a double door version and as a premium combination with a washable fleecy Winter Warmer which lines the internal body of the KatKabin for added insulation. 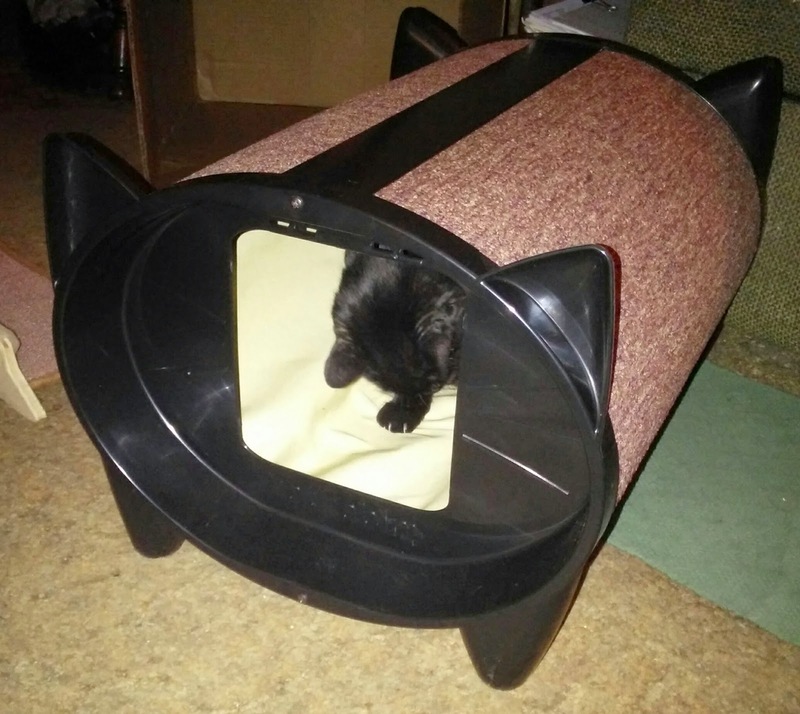 Since Truffles is an indoor cat, we received the brand new SkratchKabin, an innovative cat bed with a curved, textured scratching surface and washable cat cushion. It also comes with a free toy hanger and sisal mouse toy and is available in 3 colors: oatmeal, blueberry, and cocoa. We chose the cocoa which perfectly matches our living room. 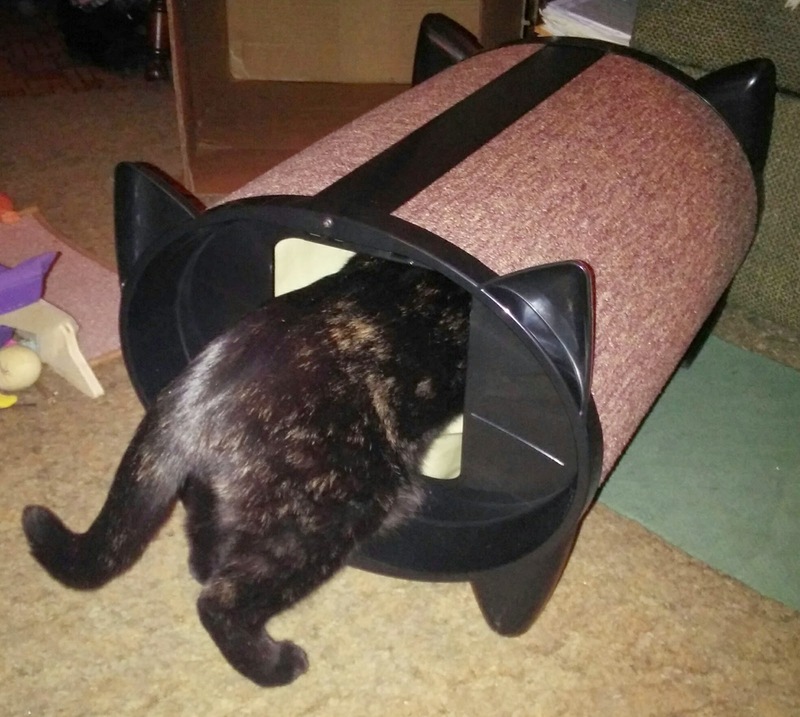 Our ScratchKabin arrived (already completely assembled) in a ginormous box, which Truffles busied herself with while I took a moment to admire just how adorable and stylish this piece of cat furniture is. I am completely in love with the cat shape right down to the ears, whiskers, and feet. Excuse me while I straighten things up a little and make myself comfortable. There's even room for a toy or two! 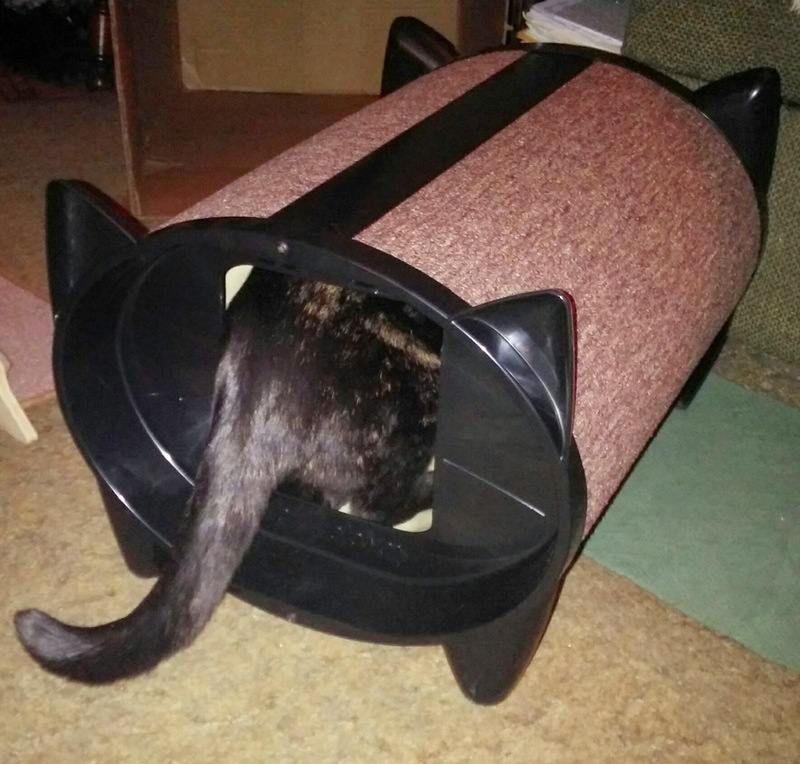 I guess it's pretty obvious that she absolutely loves it. 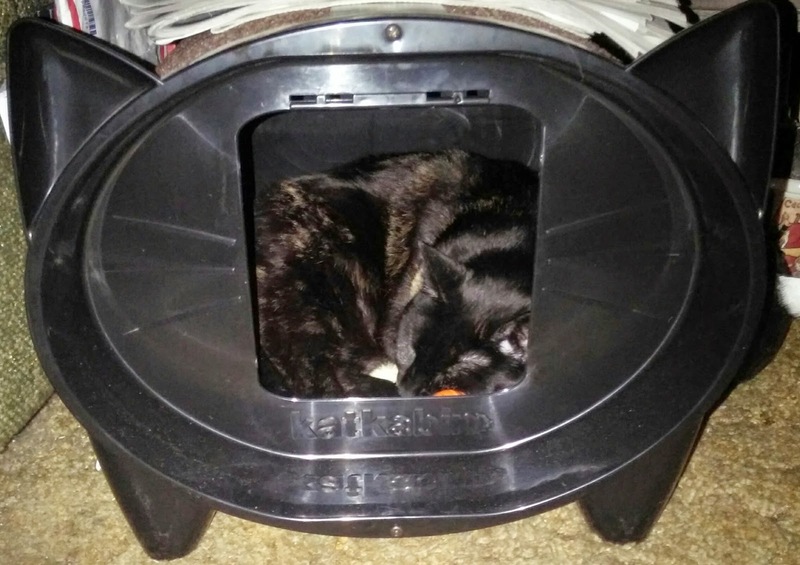 I wondered how quickly she would take to it since she's never slept in anything closed in, but she climbed into it immediately and she spends time in her SkratchKabin every single day. It's even roomy enough for her to take a bath or play in! 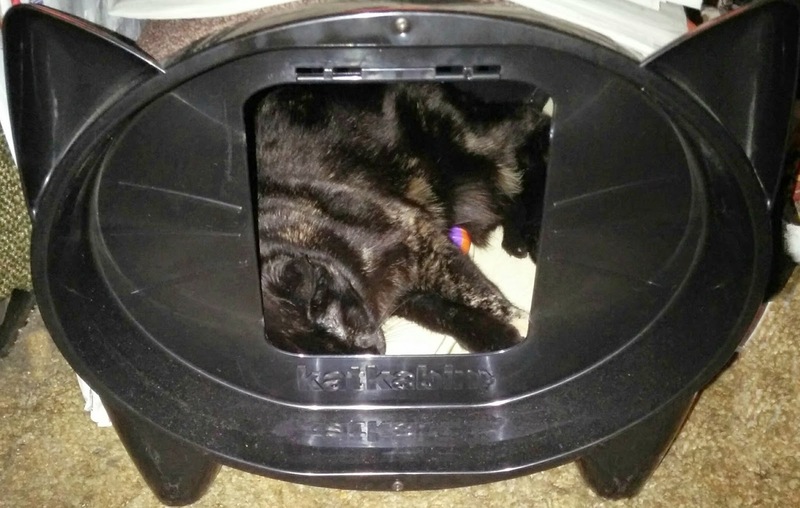 SkratchKabins provide cats with a cozy, secluded place of their own to snooze and exercise their natural instinct to scratch while protecting your carpet and furniture. All versions are available in a beautiful range of colors that can either blend in or stand out in your garden, outdoor area or home. 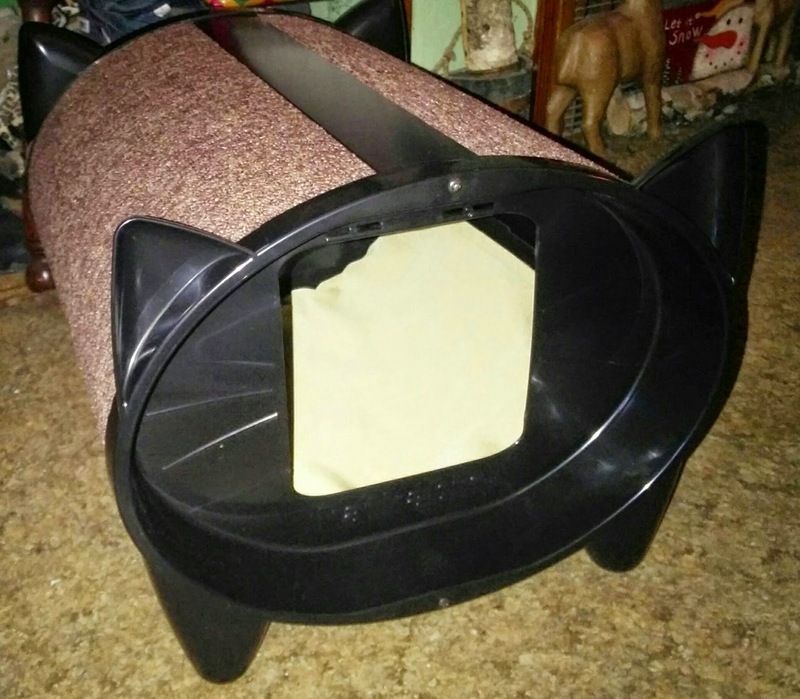 Wherever you choose to put yours, this is one cat house that makes a stunning design statement! Instead of providing a giveaway to one winner, the KatKabin people are generously offering a special discount to our readers so that you can get order whatever product you would like. Just go to the KatKabin site and at checkout, enter the promotional code REF86Q84 to receive 20% off your purchase. This offer is valid for the entire month of May. The prices range from $99.00 to $129.00 for the Kabins and the accessories range from $9.99 to $49.99, so this is the purr-fect opportunity to treat the fashionable feline in your life to something extra special. Disclosure: We were sent one ScratchKabin™ by KatKabin® in exchange for our fair and honest review. Receiving free product did not influence our opinion about it; all opinions expressed on this site are our own. What a cool looking cabin! OMC Truffles dat looks so cool. Weez wish we got sum of those oppurrtunities to twy out such cool fings. One of these days maybe we will. We luv da cat face wiff da ears on it. It's fur sure cat but looks like it belongs in yous mommys house. Enjoy. love the Scratch Kabin, it is adorable, that's a shame they didn't do a give-away though. Regardless, it is darling. 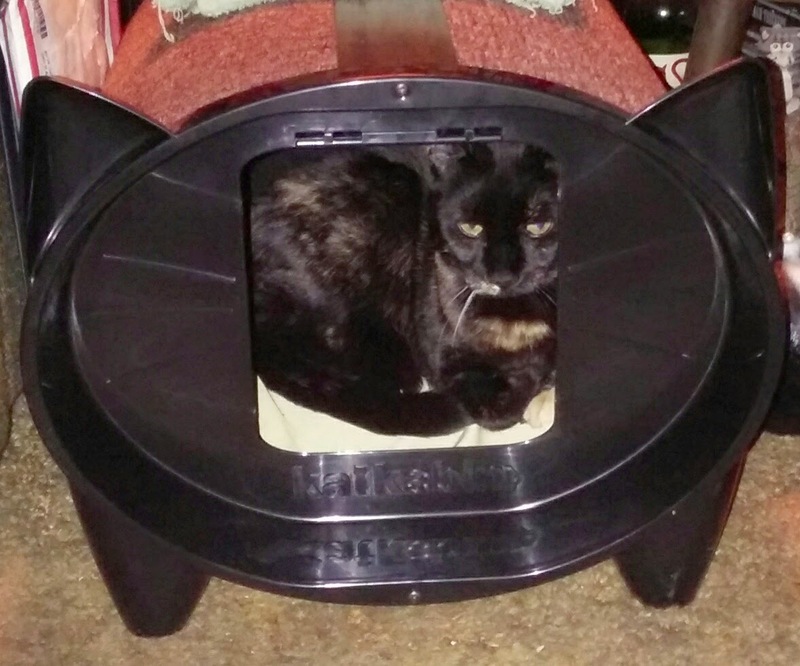 It looks like Truffles really loves her Kabin! I know that Carmine would really like one of these; he loves to sleep in cubes. OH Truffles we are so thrilled for you! That looks like one cozy cabin! What a beauteous Cabin! Mes could use one of those....looks at Mom. We like those but our Mom is skeptical on whether or not we'd fit through the door. And whether they are easy to knock over in the wind or pull over when scratching. We think she should give one a try but Quint will need to sell more paintings first. Thanks for you review and for the discount! We'll work on changing Mom's mind! Coolio! Looks like a nice private hidey hole! We're big fans and have both versions. We keep one outdoors for ferals. It's been 4 years in all weather and it's as good as new. Truffles looks cute in it.